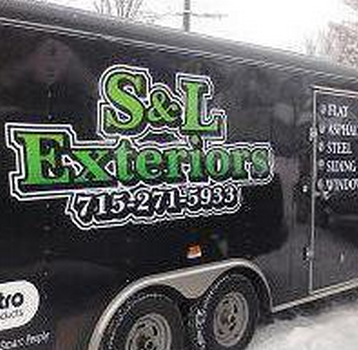 We are S & L Exteriors. We are a certified and fully insured company with the Wisconsin Department of Safety and Professional Services. Our owner and employees have 15 years of experience working in both residential and commercial, installing asphalt, metal, EPDM, Atlas and Metro roof systems. We work throughout the Chippewa Valley. During the winter months, we provide roof snow removal service--removing the weight of snow from a roof will improve the integrity of the roof and prevent a collapse. We are your roofing expert since 2012. We are offering free estimates. Contact us today! Q.How many projects do you average in a year? A.100 projects completed throughout one years time. Each project varies in levels of difficultly and type of product being installed. Q.What services do you provide your customers after the work has finished? A.Providing discounted snow and ice dam removal. Q.What information do you recommend to have readily available before looking for a professional in your trade? A.Research the different types of roofing systems that are out there and find the one(s) that you feel best fit your needs. If it's possible, know the age of the existing roof. If this is an insurance claim find out what your insurance will or will not cover. Q.What certifications or professional affiliations do you have? A.Certified installer for Metro Systems (Stone Coated Steel Shingles), EPDM (rubber), Altas Asphalt Shingles (algae resistant shingles) and Dwelling Contractor Lic. Also holding a Wisconsin Contractors & Journeyman License. Q.What areas of your trade do you specialize in? A.Exteriors; roofing (asphalt, flat, metal, EPDM , Metro and Atlas), siding, windows & gutters. Roof snow and ice dam removal. Q.What types of jobs are the most common? A.The most common job would be installing asphalt shingles on a residential single family home. This would include hipped roofs, valley roofs & gable roofs. As well as working with storm damage, insurance claims & new construction. Q.How did you get started? A.Roofing and exterior work has been family a business. Knowledge has been passed from generation to generation. Q.What questions should a customer ask before hiring a professional in your trade? A.Do you carry insurance? Are you certified to install the product? What is your experience working with the material being installed? Is there a warranty? Do you complete jobs in a timely manner? Q.What are the most frequent questions you get from customers? What are the answers? A.How long will the job take? The duration of the job will be discussed after an estimate is done. Is there an installers warranty? Both the product and installer are covered by a warranty. Is the contractor insured? S&L is a fully insured company. Are the product being used made in the USA? All material used is made in the USA. Do you require a down payment? Half down is required prior to starting job. Remaining payment is required at job completion. Who purchases materials? The installer will purchase material unless otherwise discussed. Q.What would you recommend customers looking to save money? A.For a customer that is wanting to save money and will be living at the residence temporarily, asphalt shingles are the most cost efficient. However, if the customer is not planning on moving we highly recommend installing a Metro, steel shingle roof system. Metro shingles are a lifetime shingle and are maintenance free. Q.What brands or products do you work with? Q.What do you wish customers knew about your profession or trade? A.Not all roofing systems are the same, research both the product and installer. Make sure the installer is certified to install the product and is fully insured. Roofing system can also be installed during the winter months.